Most of the commercially interesting compounds and those affecting the environment are poor water soluble. Bacteria able to carry out the bioconversion or bioremediation of such compounds in systems using organic solvents as substrate and/or product reservoir are valuable. Strains of Rhodococcus have been reported to be particularly solvent tolerant whilst presenting a broad array of enzymes with potential for the production of industrially relevant compounds and/or for the metabolism of recalcitrant organic solvents. Under stressful conditions, these cells can adapt the cell wall and membrane compositions, as well as the physicochemical properties of the cell surface, can degrade or bioconvert toxic compounds such as benzene and toluene, and can aggregate and produce exopolymeric substances to protect the cell population. 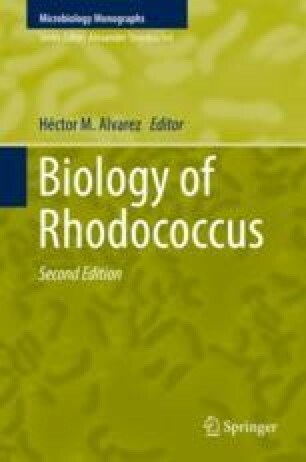 The adaptability and versatility of Rhodococcus cells can further broaden their application scope. The author acknowledges Fundação para a Ciência e a Tecnologia, I.P. (FCT), Portugal, for financial support under programme “FCT Investigator 2013” (IF/01203/2013/CP1163/CT0002).